We manufacture Webbing Slings upto115 tons capacity as per IS:15041:2001 standards and ASME B30.9 standards. Flat Webbing Lifting Slings are made from high tenacity polyester webbing, colour coded for ease of identification for lifting They are available in four basic types: Simplex, Duplex Triplex and Endless. Simplex Slings are manufactured from single thickness webbing, whereas Duplex slings are manufactured from double thickness webbing and Triplex of Three layers upto10 layers. All are either terminated in a metal end fitting or, more popularly, sewn back upon themselves with a high tenacity Polyester fabric to form a reinforced Eye, which provides greater durability than the traditional leather eye. The webbing is stitched close to the eyes which are upto45 " long bearing to bearing. Endless slings, however, are manufactured from single thickness webbing sewn in a continuous loop with an overlap. 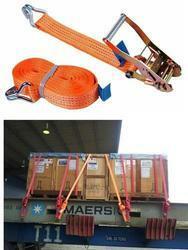 These slings are mainly used when needing a wide grip on large equipment, e.g. for lifting pipes. In order to protect the webbing from unnecessary wear and tear, various sleevingis available, in any length, which can also protect both the sling and any fragile loads. 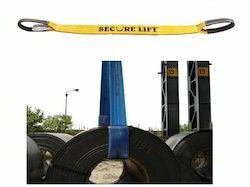 SECURE LIFT is a heavy duty non metallic sling, made of polyester. These are flat woven webbing slings with Eye-loop at the ends. These are available in different lengths and different weight lifting capacities ranging from 1 ton upto 48 tons. The polyester webbing slings, with reinforced eyes at both sides, are manufactured as per BS 3481 Part 1 and Part 2 1983 and EN 1492-1 norms. The safety factor is 7:1. We are manufacturers of a wide range of cargo lashings from 1" (25 mm ) to 4"( 100 mm ) wide and lashing capacities ranging from 400 kgs to 5000 kgs as per en-12195-2: 2000. A two part system consists of a short part and a long part with a tensioning device provided on the short part. Variety of hooks or end fittings as shown below can be provided. 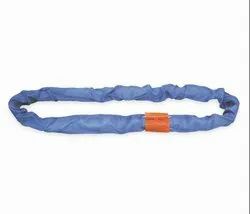 Looking for Polyester Lifting Belts ?